The average salary for a nuclear engineer in the United States is around $82,227 per year. This is 36% above the national average. ● Updated in 2017. 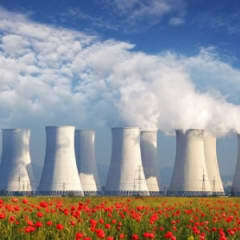 Nuclear engineers earn an average yearly salary of $82,227. Wages typically start from $68,669 and go up to $136,014. How much does a nuclear engineer make in the United States? How much does a Nuclear Engineer earn? James Madison, President of CoolHandNuke.com, a job site for nuclear professionals, says several factors help nuclear engineer salaries - the high caliber of nuclear engineering graduates, the sensitive nature of their work, and a decreasing number of people entering the field. James Madison predicts an upswing in the need for nuclear engineers that could mean better salaries in the future. "Over the course of the next 10 plus years, these engineers will start being paid very, very well," he said. "And the benefits packages are already the best of any industry." The Bureau of Labor Statistics found that nuclear engineers working for independent engineering agencies (such as scientific and consulting services and research and development) tended to earn the most. How do nuclear engineer salaries compare to similar careers? Nuclear engineers earn about the same as related careers in the United States. On average, they make less than photonics engineers but more than computer systems engineers.